Wikipedia is an interesting case when it comes to SEO. On the one hand, they’re an incredibly massive, high profile site full of authority. They have authority in a web sense, and authority in a factual sense. They’ve become a dominant informational source in dozens of languages around the world, despite being able to be edited by anyone with an account. 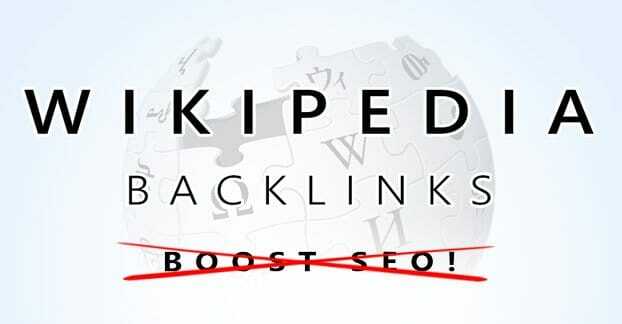 While you might think that makes it an excellent source for backlinks to rank a site, you might be wrong. The last bit there, the part where anyone at all can edit a Wikipedia article, makes it a problem for someone like Google. If they want to count links on Wikipedia as authoritative, they have to take into account the fact that anyone – including the owner of the site being linked to – can add the link to the page. It does no good to count a link as a source of authority and a recommendation when the link is from the owner of the site being linked. That’s the same reason private blog networks are a bad idea, and why linking between several sites you own is considered bad practice. It’s also a problem for Wikipedia. If you owned a site like Wiki, would you want anyone and their mother to be able to use you for link juice? You would be squeezed with low quality pages filled with links in no time. If you think about it, it’s the same problem you get with spam link comments on blog posts, dialed up to 11. It’s like a site that’s made of nothing but blog comments. I actually shuddered a little thinking about how horrible that would be. Then I realized that’s basically Facebook and Reddit, which really vindicated my thoughts. Anyways, Wikipedia did indeed see these SEO problems ahead of time, and they implemented nofollowed links across the whole site. Even if a link is to a verified authority, they still keep the link nofollowed. 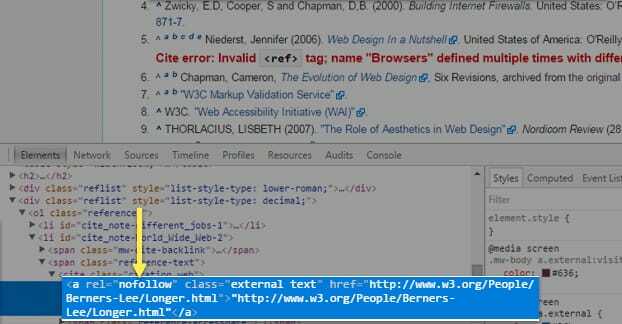 This means any link on Wiki is valueless from a pure SEO perspective. So why bother even talking about it? It seems like I should be able to answer the title with a simple “no” and be done with it. The fact is, Wikipedia has a lot of potential value for a site, but only if you go about it the right way. Links may not give you link juice, but they give you positioning and authority in terms of being a cited source on a wiki article. Now, one of the more common techniques for getting your site on Wikipedia is to make your own wiki page. If you make a well-cited, informative page about your company, complete with history, information about your CEO, mergers, and other information, you might be able to get it to stick. For example, take a big company like Verizon. You can see their wiki page here. It starts with an overview and history of their company. Then it has a detailed history, a detailed section about their various business lines, information about their major marketing campaigns, their corporate structure, and a lot more. There are thousands of words of content on this page, and there’s that informational box to the side, with a ton of quick facts and links about them. Now look at where links come into play on that page. Virtually every in-text link is a link to another Wikipedia page. There are two links to Verizon’s homepage in informational boxes, and then there are a bunch of links in the footer as cited sources. Now, as a smaller business, you’re unlikely to be able to make so robust a page. And that’s a problem, because let’s face it, the less history and the less variety your company has, the less informational the page will be, and the less Wikipedia users will like it. You also have less information to cite about you, and would have to produce it on your own website, which is generally frowned upon by wiki. In fact, you might not be a big a deal as you think you are. Take Neil Patel, for example. He’s a pretty high profile entrepreneur, he runs several big marketing companies, he’s been cited on Forbes in top entrepreneur lists… and he had his Wikipedia page deleted. In a way, his success shot himself in the foot. He’s been cited on Forbes, but he’s also a contributor to Forbes, so that means Forbes is no longer a “reliable source independent of the subject.” Neil’s page was factual, but it was factual in a way that came across as a promotional piece, talking about his successes but never his failures, and so forth. The result is a deleted page for someone who is pretty much an industry leader. So if the value of a link on a Wikipedia page comes from social authority, the ability for people to recognize your brand name and find it mentioned on authority sites, I have a question for you: do you really need a page of your own? You can often do just as well with a mention on a more generic page, like a list of marketing companies page or a page about certain techniques using you as an example. If you’re trying to get a page of your own on Wikipedia, you need to pass their notability test. This is a test based on a series of guidelines that helps determine whether a topic warrants an article of its own. If you don’t meet the notability requirements, you won’t be able to make a page, or you will have your page removed. What are the guidelines? Well, the information on the page must be verifiable with third party sources not affiliated with your topic. A topic is presumed to merit an article if it either meets the general notability guidelines or the subject-specific guidelines, and is not excluded in their specific list of exclusions. Let’s look at the exclusions first. Wikipedia is not a dictionary. They don’t want pages dedicated to definitions, dictionary entries, or slang and idiom guides. Wikipedia is not a publisher of original thought. It’s not a place to publish research, personal essays, inventions, or other firsthand creations. Publish elsewhere, and cite on Wikipedia if it becomes notable. Wikipedia is not a means of promotion. Propaganda, recruitment, opinion pieces, scandal mongering, self-promotion, advertising, and marketing are all not allowed. This is the one most likely to get brands looking to get SEO value from Wikipedia. Wikipedia is not a mirror for links, images, or media. This is why Wikipedia tends to be full of internal links, not external links. Media sources often can be published on Wikisource, but not Wikipedia directly. Wikipedia is not a blog, web host, social network, or memorial site. Using as such will get that content removed and, likely, the user blocked from editing future content. Wikipedia is not a directory. Sales catalogs, genealogical entries or family trees, yellow or white pages, and other types of content have their own websites. Wikipedia is not a manual, guidebook, journal, or textbook. Content like game guides, FAQs, and travel guides are not allowed. Wikipedia is not a “crystal ball.” Speculation is not fact and has no grounds to be in a Wikipedia page. There are more, but they tend to get less relevant the more they go on. The main point is that Wikipedia is meant to be a site for facts about noteworthy or notable people, places, events, and other things. If you think your brand is sufficiently notable and can pass the guidelines when creating a page, go for it, but I highly recommend only doing so if you’re sure you’ll pass muster. If you get your content removed, any future additions of your content will be more likely to be scrutinized heavily or removed simply because you’re known to try to market using Wikipedia. 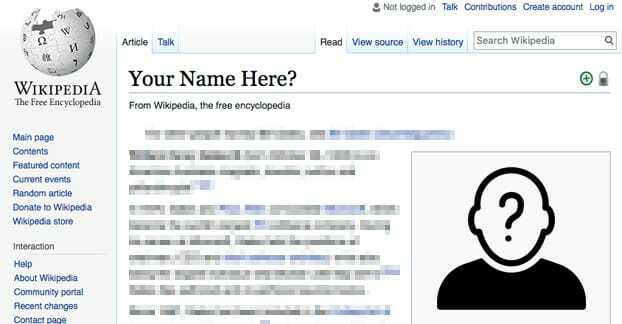 There are a few ways you might be able to get your mention or link on Wikipedia, ways that don’t require you to make a page for yourself. The first thing you should do is perform a site-wide search for your brand already. It’s entirely possible that someone else already added you. If this is the case, you can use this as a basis for expanding your presence, or simply leave it as is. As for off-Wiki techniques, you should first start by broadening your mentions on other sites. 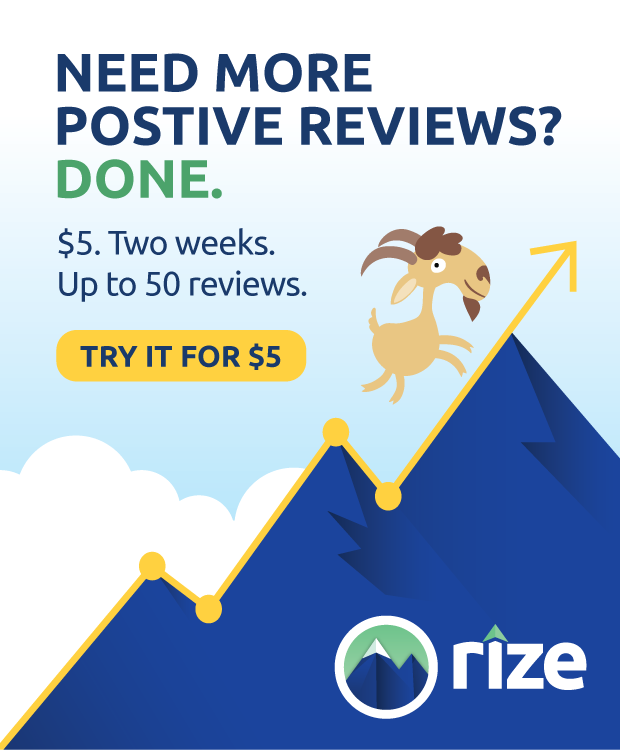 Try to start a PR campaign that gets you mentioned on high profile sites that aren’t affiliate with you. If they can find a guest post by you on the site, it can cause that source to be rejected, which isn’t a good foot to start with. Some people recommend starting with a stub, rather than a full article. Creating a basic stub shows that you’re not necessarily trying to get your site a full presence, but more that you think it might be noteworthy enough to pass you off as valuable content. It’s important that if you do this, you don’t use a username that’s easily traced to your company. If SEBrandWarehouse makes a page for the South East Brand Warehouse Company, it’s pretty damn transparent. If the CEO of your company registers their name as the name to edit the page, it’s also easily traced. You might also consider using a proxy, just to avoid situations where someone traces your IP address to your headquarters when you’re editing the page. A stub works kind of like a challenge for Wikipedia users. Other editors who want to fill out stubs wherever they can will see it and will try to fill it out. It helps if you aren’t the one making the page, or if several people are contributing to the page. You should, in every case possible, have a third party link for your content. Source everything you contribute, and try to source it from places that aren’t your website. The exception might be a company history, where you being a primary source could be valuable, but even that should link to third party verifiable sources as well. If you do manage to get a foothold, make sure that you keep an eye on your discussion page. This way you can respond to concerns about the content you post, and ask for help. If you’re earnest about improving the quality of the content to make it up to Wikipedia’s standards, you can get ahead much more easily. There is a website framework called Wikia that mimics the Wikipedia format, and is used for niche wikis that compile information without being notable enough to go on the actual Wikipedia site. It’s generally for niche topics where going into great detail is overkill for Wikipedia itself, but the information is still useful for its community. Some of them are bad. For example, marketing.wikia.com is a great domain that has been completely disused. It has 24 pages, a completely empty homepage, and is not useful to anyone. Some of them are better. The entrepreneur wiki is a pretty good database of information about individual entrepreneurs. 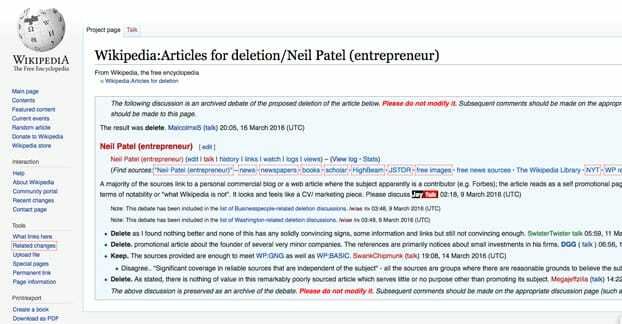 It’s the site Neil Patel should probably be on rather than Wikipedia itself. He does have a profile there, but it’s rather anemic. Pretty much every industry or niche can support a wikia, but it requires a lot of community input. If your community doesn’t want to take the time to support a Wikipedia variant, it’s not going to grow, and it’s not going to become a valuable resource. It’s always an option to found your own wikia variant, but you need to be able to keep it up and going. You can’t simply make one and hope it thrives on its own. It’s a lot of work to set one up, and keeping it up to date is almost as big a job. Frankly, it probably isn’t worthwhile. Dan Virgillito is a freelance content strategist with a passion for good storytelling and all things digital. He lived in the Netherlands, Poland, England and Sicily. Say hi on Twitter.